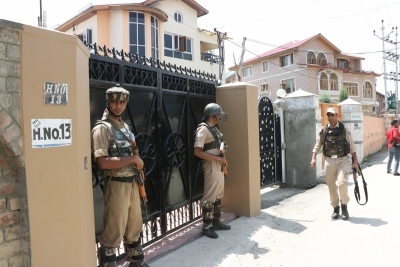 New Delhi/Srinagar, Aug 16 (IANS) The National Investigation Agency (NIA) on Wednesday raided a dozen places in Jammu and Kashmir in connection with its ongoing probe into the terror funding to stoke unrest in the valley. The searches were carried out in Srinagar, Baramulla and Handwara to probe the funding from Pakistan and militant groups based there, an NIA official said. Those searched included three close associates of Zahoor Watali, a prominent businessman in Kashmir, who was already under the NIA scanner and has been quizzed by the agency officials earlier. Watali’s residence in Gurugram, Delhi and Srinagar were raided in June. The NIA is also raiding the houses and office of Shafi Rishi, a prominent lawyer in Kashmir and Peerzada Nabi, a prominent businessman. Official sources said that evidences have been found against Watali, Rishi and Nabi about their involvement in the terror funding. On July 24, the NIA arrested seven separatist leaders — Altaf Ahmed Shah, Nayeem Khan, Peer Saifullah, Raja Mehrajuddin Kalwal, Aftab Hilali Shah alias Shahid-ul-Islam and Ayaz Akbar Khandey and Farooq Ahmad Dar alias Bitta Karate. They were arrested on the charges of criminal conspiracy and waging war against India. Altaf Ahmad Shah is the son-in-law of Hurriyat leader Syed Ali Shah Geelani, who advocates Jammu and Kashmir’s merger with Pakistan. Islam is a close aide of Hurriyat leader Mirwaiz Umar Farooq. Ayaz Akbar is the spokesperson for the Geelani-led Hurriyat. On August 8, the NIA also questioned several persons, including the two sons of Geelani — Naeem and Naseem Geelani; Faheem Ali, a Deputy Superintendent of Police who was personal security officer of Umar Farooq; and Devender Singh Behl, a lawyer associated with Geelani.